My nephew's birthday is on the 13th and of course I will need a card for him. I'm not sure if I will have a lot of time to make a card. Our son's wedding is on the 14th. It's going to be a busy week! This is a card that Terri made for the Tuesday Technique group. She made one especially for me. She's SO sweet! Let me tell you how sweet she is. When the gals were doing this technique she had extra bubble wrap out for them to use at the tables and there was a piece in their packet for them to take home so they didn't have to use the one in the packet and get their projects messy. SO sweet and thoughtful!! There is no technique group this month because of Leadership but it will resume in February and I'm so looking forward to it! This is a very fun technique. I had done it a while ago and it's very easy with such a wonderful effect. You take a piece of bubble wrap and ink up your brayer. 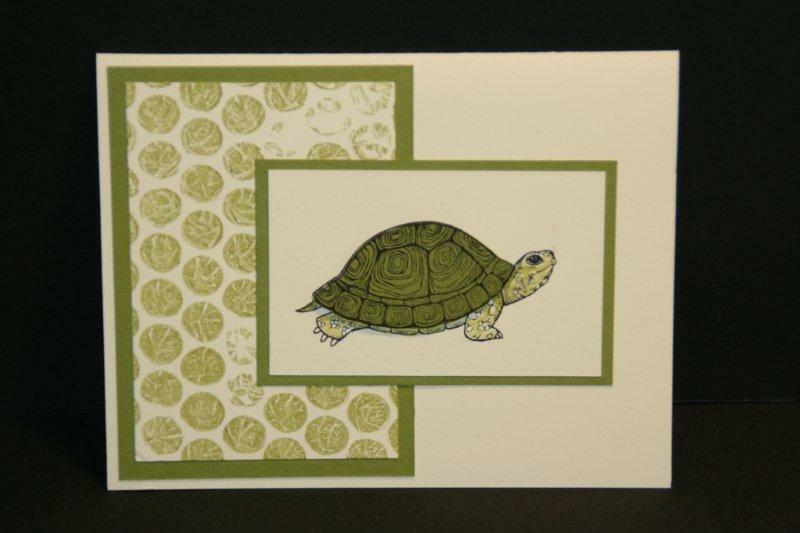 Roll the brayer over the bubble wrap and then press the bubble wrap onto the card stock. It's just that simple!! What a cute effect, huh? And the turtle is a perfect image to show off this technique. So I now have a card for my nephew and the next step is getting it mailed to him in time!! I am hoping it will go out in Monday's mail! Wish me luck on that. I've got a ton of things to tend to for the wedding and I'm I can remember everything I need to do! Great Card Wanda, Thank you for sharing it!